Never touch the glass portion of a halogen bulb with your bare hands and always wear eye protection when handling or working around the bulbs: When a halogen bulb breaks, it is dangerous. These bulbs contain pressurised gas. If one is broken, it will explode and serious injuries could be caused by the fl ying glass. If the glass portion is touched with bare hands, body oil could cause the bulb to overheat and explode when lit. Always keep halogen bulbs out of the reach of children: Playing with a halogen bulb is dangerous. Serious injuries could be caused by dropping a halogen bulb or breaking it some other way. 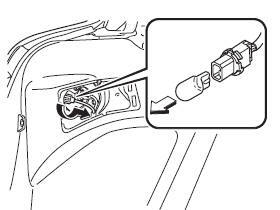 To replace the bulb, contact an expert repairer, we recommend an Authorised Mazda Repairer. If the halogen bulb is accidentally touched, it should be cleaned with rubbing alcohol before being used. Use the protective cover and carton for the replacement bulb to dispose of the old bulb promptly and out of the reach of children. The LED bulb cannot be replaced as a single unit because it is an integrated unit. The LED bulb has to be replaced with the unit. 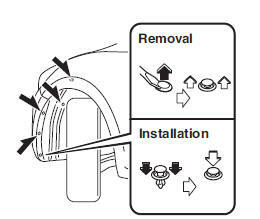 We recommend an Authorised Mazda Repairer when the replacement is necessary. 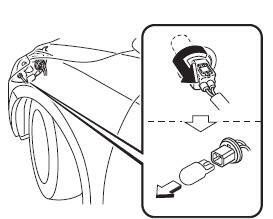 If you are changing the right bulb, start the engine, turn the steering wheel all the way to the left, and turn off engine. 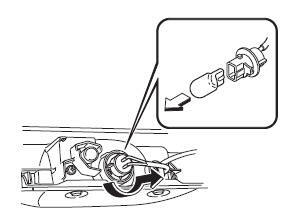 If you are changing the left bulb, turn the steering wheel to the right, and turn off engine. Make sure the headlight switch is off. 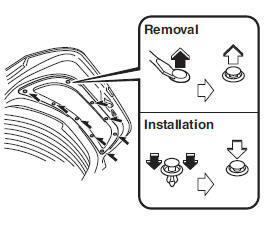 Pull the centre of each plastic retainer and remove the retainers. Turn the screw anticlockwise and remove it, and then partially peel back the mudguard. 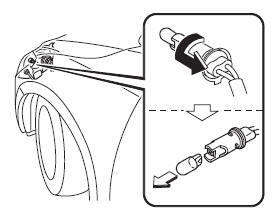 Disconnect the connector from the bulb. Detach the sealing cover from the bulb. Unhook the bulb retaining spring. 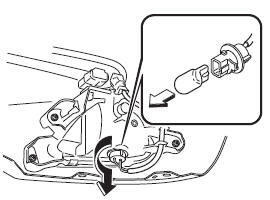 Swing the retaining spring out and away to free the headlight bulb. 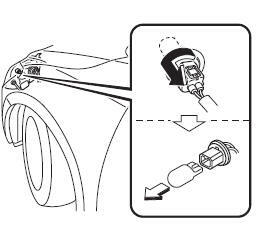 Carefully remove the headlight bulb from the socket by pulling it straight back. 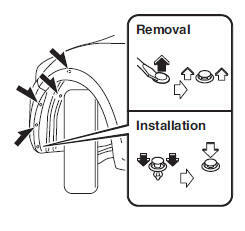 Install the new bulb in the reverse order of the removal procedure. Use the protective cover and carton of the replacement bulb to dispose of the old bulb promptly out of the reach of children. 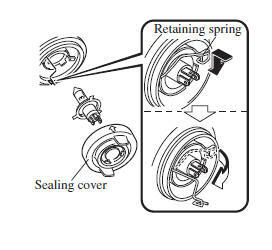 When reinstalling the sealing cover, make sure it is fi tted correctly. 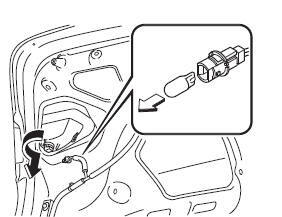 Turn the socket and bulb assembly anticlockwise and remove it. Disconnect the bulb from the socket. 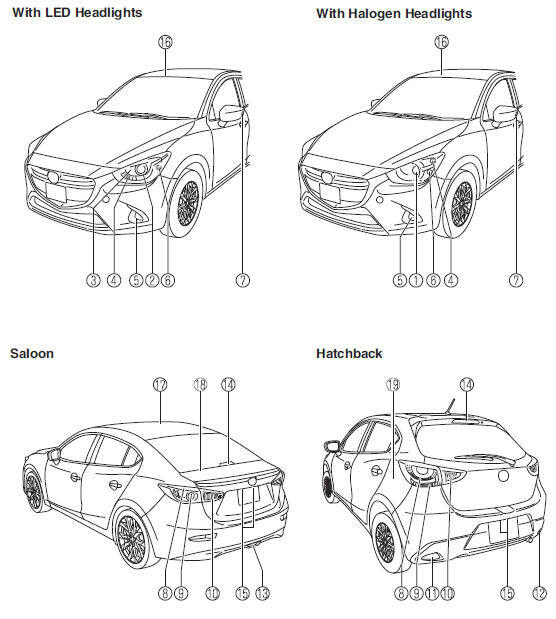 Make sure the ignition is switched off, and the fog light switch is off. Disconnect the connector from the unit by pressing the tab on the connector with your fi nger and pulling the connector downward. Turn the socket and bulb assembly to remove it. Carefully remove the bulb from its socket in the refl ector by gently pulling it straight backward out of the socket. 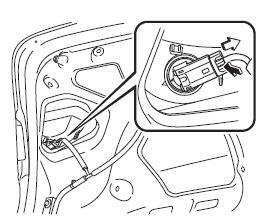 Make sure the ignition is switched off, and the headlight switch is off. Insert the cover tabs and install the cover. Turn the bolts anticlockwise and remove them. 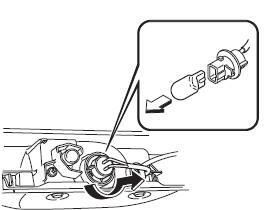 Pull the unit rearward to remove it. 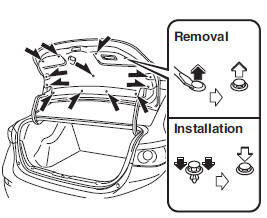 Peel back the boot lid trim. 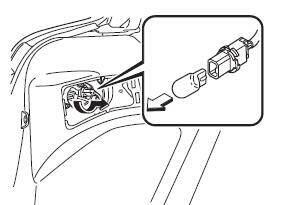 Disconnect the electrical connector from the bulb by pressing the tab on the connector with your fi nger and pulling the connector. 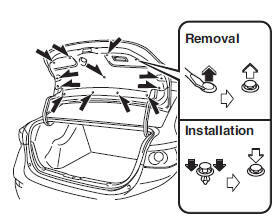 Remove the cover on the interior surface of the liftgate. Disconnect the connector from the socket. 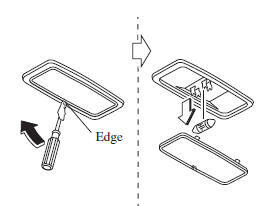 Wrap a fl athead screwdriver with a soft cloth to prevent damage to the light unit. 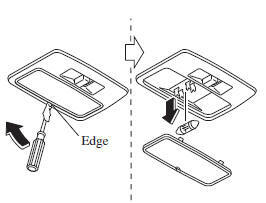 Insert a fl athead screwdriver into the position shown in the fi gure and pull the light unit outward. Wrap a small fl athead screwdriver with a soft cloth to prevent damage to the lens, and then remove the lens by carefully prying on the edge of the lens with the fl athead screwdriver. Disconnect the bulb by pulling it out.